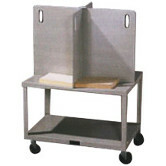 The paper stock cart is the ideal tool to move paper around from copier to finishing equipment or from cutter to folder. 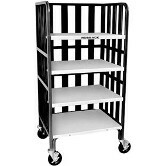 The Model 126 Stock Cart has a shelf size of 26" x 26". It includes 2 shelves and has 2 locking wheels. You can purchase 2 more shelves to max the shelves to 4. The shelves are heavy duty metal that handle up to 800 lbs. and tilt back to avoid spilling. 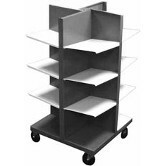 The Model 139 Stock Cart has a shelf size of 26" x 39". It includes 2 shelves and has 2 locking wheels. You can purchase 2 more shelves to max the shelves to 4. The shelves are heavy duty metal that handle up to 800 lbs. and tilt back to avoid spilling. 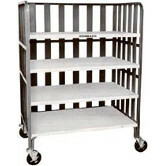 The Model 140 Stock Cart has a shelf size of 12" x 26". It includes 4 Divided Shelves and has 2 locking wheels. You can purchase 2 more shelves to max the shelves to 4. The shelves are heavy duty metal that handle up to 800 lbs. and tilt back to avoid spilling. 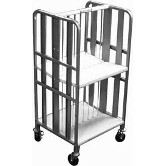 The Model 160 Stock Cart has a shelf size of 13" x 17". It includes 4 shelves and has 2 locking wheels. You can purchase more shelves in packs of 4 to max the shelves to 16. The shelves are heavy duty metal that handle up to 800 lbs. and tilt back to avoid spilling.